LONDON--(BUSINESS WIRE)--Technavio analysts forecast the global carbon monoxide (CO) alarm market to grow at a CAGR of above 6% during the forecast period, according to their latest report. The research study covers the present scenario and growth prospects of the global CO alarm market for 2017-2021. Technavio presents a detailed picture of the market by way of study, synthesis, and summation of data from multiple sources. One of the measures to alert the occupants in residential and commercial buildings about the presence of CO is to install CO alarms. The increasing number of CO accidents has driven the market for CO alarms globally. The inhalation of exceeded concentration of CO can lead to various health hazards such as nausea, impaired thought process, respiratory failure, and even fatality. CO is also known as the silent killer because of its odorless and colorless nature, which makes its presence hard to detect. It is a hazardous gas, which if inhaled results in suffocation and permanent damage to brain and lung tissues. One way to alert the presence of CO is to install a CO alarm. CO is a hazardous gas that affects the brain and the blood circulation system. There are various safety standards for CO detectors, which includes CO alarms as well. Various local, regional, and national safety authorities are adopting the use of CO detectors to avoid any unwanted incidences. “The National Fire Protection Association 720 provides standards for the performance, installation, inspection, operation, and maintenance of CO detection and warning equipment, which includes CO alarms,” adds Sarah. Commercial and residential end-users include individual consumers, commercial buildings, public premises, healthcare organizations, and educational institutions. Any CO leaks or accumulation of CO can affect people. The increasing number of accidents and the requirement of the safety of people resulted in the increased demand for CO alarms. Common sources of CO are found majorly in home appliances such as geysers, dryers, and refrigerators and areas that lack proper ventilation such as garages. Since CO is odorless and colorless, the risk of affecting individuals is high. Therefore, the need for CO alarms has been increasing from residential and commercial end-users. Become a Technavio Insights member and access all three of these reports for a fraction of their original cost. As a Technavio Insights member, you will have immediate access to new reports as they’re published in addition to all 6,000+ existing reports covering segments like agricultural equipment, health and wellness, and outdoor gear. This subscription nets you thousands in savings, while staying connected to Technavio’s constant transforming research library, helping you make informed business decisions more efficiently. 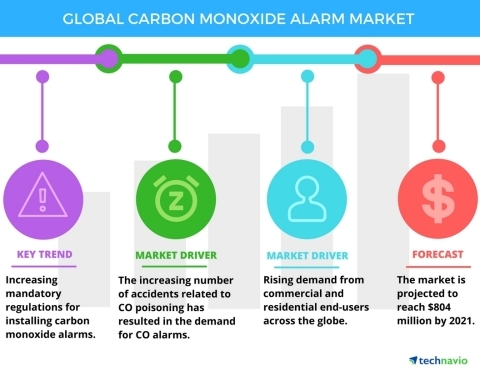 Technavio analysts forecast the global carbon monoxide (CO) alarm market to grow at a CAGR of above 6% during the forecast period, according to their latest report.